Brachial Plexus Neuropathy is a condition that produces pain, decreases movement, and decreases sensation in the shoulders and arms. The brachial plexus is a network of nerves that extends from the upper spine to the chest, shoulder, arms, and hands on both sides of the body. The pain arises when a nerve injury affects the entire network of nerves, causing pain, discomfort, and loss of function. 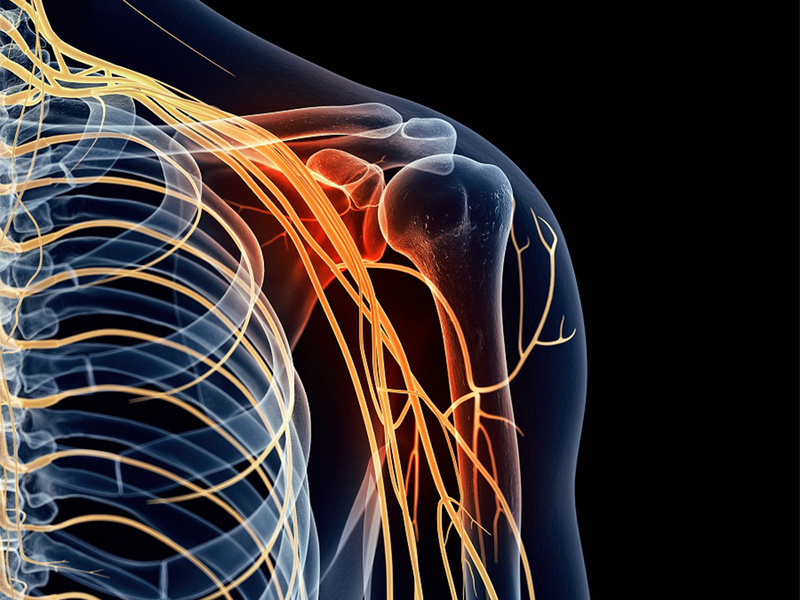 In minor cases, brachial plexus neuropathy is commonly known as a “stinger” or “burner” because of the stinging or burning sensation that shoots down the arm after a hard hit to the shoulder. Football players, rugby players, and hockey players are some of the most common athletes to experience this condition. Unfortunately, new born babies are also susceptible to brachial plexus neuropathy during the delivery procedure. In any event, Brachial Plexus Neuropathy can be treated at SF Bay Peripheral Neuropathy in San Ramon using a specialized Calmare device that is designed for peripheral neuropathy. If you are continually suffering from pain, numbness, or loss of motion in your shoulders and arms, you may be experiencing Brachial Plexus Neuropathy. Once the pain begins, your first priority should be to schedule an evaluation with a San Ramon chiropractor who understands and specializes in nerve damage. The number to call is (925) 393-0100. At SF Bay Peripheral Neuropathy in San Ramon, we treat many conditions, and there is no reason for your pain to continue after being treated regularly. Our non-invasive approach to pain relief and injury recovery has proved to have very successful results. Why Does Brachial Plexus Neuropathy Occur? Brachial Plexus Neuropathy happens when there is an injury near the network of nerves that extend from the spine to the shoulders, arms, and hands. The upper nerves of the brachial plexus are damaged when the neck stretches up (away from the shoulder), while the shoulder is pushed down (away from the neck). The lower nerves of the brachial plexus, however, are damaged when the arm is unexpectedly or repeatedly forced above the head. Pain typically begins when one or many of the nerves are inflamed, stretched, compressed, or, in severe cases, ripped or torn away from the spinal cord. In most cases, however, the pain is only present on one side of the body and the pain may reduce after several hours or days, depending on the severity of the injury. Causes of brachial plexus neuropathy include auto accidents, motorcycle accidents, blunt trauma (sports), inflammation of the surrounding tissues, and compression from a growing tumor or other condition. To learn more about finding treatment for Brachial Plexus Neuropathy and how SF Bay Peripheral Neuropathy can help you recover, call (925) 393-0100 today to schedule an appointment. How Does SF Bay Peripheral Neuropathy Assess Brachial Plexus Neuropathy? Assessing the pain is actually one of most difficult things to do for doctors because it’s about communication, and establishing a dialogue about pain between the patient and doctor can be challenging based on the amount of information to obtain in a short amount of time. For instance, a typical assessment will begin with consulting your health history. Doctors will want to know if the pain is intermittent or constant, the kind of pain (e.g., shocking, stabbing, burning), pain triggers, when pain is more likely to occur during the day, and how much pain you are in on a scale of 0-10. After establishing a dialogue of your situation and understanding the extent of your pain, doctors will inquire about previous treatments and any medications you are taking. Some doctors may ask you to keep a journal of the pain that details when you have pain and the types of pain that occur. This will help them better understand the patterns of your condition. Once brachial plexus neuropathy has been determined, treatment options are discussed. One option that we offer at SF Bay Peripheral Neuropathy is the use of Calmare Therapy, which has had highly successful results when treating peripheral neuropathy and is the ideal noninvasive treatment for those who suffer from brachial plexus neuropathy. Don’t let your pain from Brachial Plexus Neuropathy prevent you from living! SF Bay Peripheral Neuropathy can help. Call (925) 393-0100 to make an appointment today.